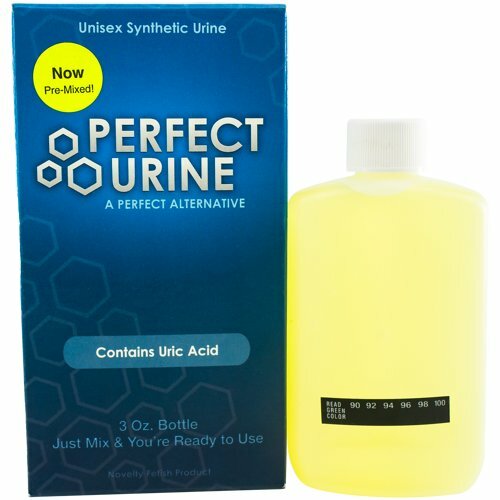 Perfect Urine is a toxin-free, synthetic urine that’s the perfect alternative to your own pee! Because it doesn’t contain any of the harmful toxins or bacteria you’d expect to find in your own urine, Perfect Urine can be used anytime you need a safer and cleaner option. If you’re looking to get your urine fetish fed, you can use a bottle of Perfect Urine without worrying about transmitting any diseases to your partner! Other than its lack of toxins and bacteria, this high-grade, laboratory crafted urine is identical to the whiz your body produces naturally. It’s the perfect substitute for your own piss! Each bottle of Perfect Urine comes with 3oz of premixed, synthetic pee for you to use to get your piss-play on safely. Although Perfect Urine is intended for fetish and novelty uses, its formula is so advanced it can even be used as a substitute for human urine in lab tests. Since it’s guaranteed to be free of all toxins, it can be used as a control sample in laboratory experiments or to help lab technicians calibrate their urine testing equipment! We’re not kidding - this stuff is so close to real urine that even high-tech lab equipment can’t tell the difference! Because it’s formulated with the same chemical compounds as the pee your body produces, it has the perfect pH balance and specific gravity. Plus, it’s got the right amount of creatinine, uric acid, urea, and many other chemical compounds commonly found in human piss. Perfect Urine is, well, perfect! To deliver the most lifelike urination experience, your Perfect Urine should be at body temperature when you let it flow. To heat it up, simply shake the bottle, remove the cap, and put it in the microwave for about 10 seconds until the attached temperature strip reads between 94-100 degrees. If the bottle feels hot, but the temperature strip remains black, just let it cool down until you see the indicator between 94 and 100. Every bottle of Perfect Urine comes with a heat pack that can help keep your sample warm for up to 8 hours. Just attach it to the bottle with the included rubber band, store it in your pocket or in The Hideaway Leg Strap, and you’ll be ready to go at a moment’s notice! Before you dispense your urine from the flip-top cap, check the temperature strip one last time to make sure it’s showing your sample is at body temperature. Give it one last shake and then empty the contents of the bottle wherever you need it most! Crafted with the perfect blend of all the chemical compounds typically found in human urine, Perfect Urine is the best option if you’re needing a safer, cleaner substitute for your own whiz. It even looks like real pee and foams when you shake it up! Grab a bottle today and try it for yourself!